Get the Eyelashes You’ve Always Wanted! Over time, eyelashes may thin, thus making your eyes less appealing. But you don’t have to settle for thinning eyelashes! 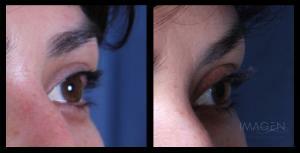 Latisse solution has shown to double eyelash fullness in 16 weeks. First you’ll notice that you have fewer eyelashes falling out. Then you’ll notice longer lashes. After a while you’ll also notice that the eyelashes are thicker and darker as well. It also works great for thinning eye brows or thinning scalp hair! Scientists initially developed Latisse for the treatment of glaucoma. (The brand name of the glaucoma medication is Lumigan.) Patients who were using Lumigan quickly noticed that they were developing amazing eyelashes! It didn’t take long to develop it as an aesthetic treatment. Application of Latisse once a day will help your eyelashes grow longer, thicker and stronger. Many of our patients don’t even wear daily mascara anymore! After 16 weeks of use for eyelashes and brows, without makeup. Actual patient without mascara—lashes not retouched. Individual results may vary. Imagen is pleased to participate in Brilliant Distinctions, Allergan’s loyalty program. Every time you purchase Latisse you earn points. These points can then be redeemed for coupons to use toward your next Botox, Juvéderm or Voluma injection or toward Latisse purchases. Sign Up Now!